As the Christmas season approaches, the many hues of red come to the fore. Indeed, scarlet, ruby and garnet are the order of the day, just by themselves or adding gravitas to necklace and earrings. 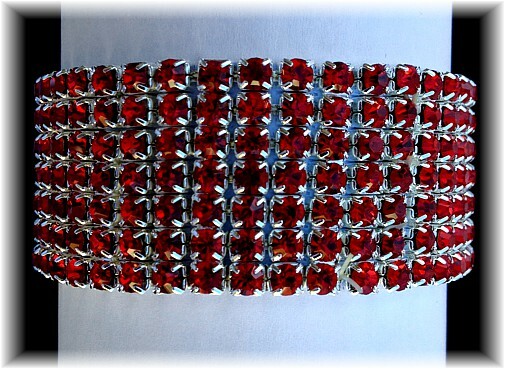 This stunningly simple bracelet comprises silver setting and seven dazzling rows of rhinestones in a regimental line-up that is colourful and impressive. Set on high-strength Lycra 15.2cm - 20cm (6"- 8"). Width: 2.5cm (1").